Not sure what a term or word means? We define and explain some of the popular terms used in the graphic design and print industry. A coating used to protect and enhance the printed piece. Our AQ coating would be considered a semi-gloss and is available on our 100lb gloss book, 100lb gloss cover, and 16PT C2S stocks. For non-symmetrical items, you can select horizontal (landscape) or vertical (portrait) orientation for your layout. Bindery occurs in the finishing department, which performs operations on the printed product after it has been printed. Bindery operations are as follows: Folding, Scoring, Perforation, Binding, Stitching, Die Cutting, & Envelope Converting. Various methods used to secure loose pages in a book is called binding. Saddle stitch and perfect bound are examples of binding. Outlines around graphics, text or edge of a sheet. The percent of light reflected back from a sheet of paper as measured by a light meter reading. Contrast is reduced, and highlights are not as strong when the paper with a lower brightness is used for a printed piece. At Primoprint, dependent on paper brand, the papers have different brightness grades. As an example Tango has 91 brightness, Balboa has 90 brightness. Standard or Third Class Mail. Paper coated on one side. Paper is coated to produce a smooth printing surface and to slow the absorption of ink. The coating acts as a barrier to help keep the ink on the surface of a printed sheet, as opposed to allowing it to seep into the paper fibers. This extra control results in sharper images and finer details. C1S or paper that is Coated One Side has no coating on the opposite side. Paper coated on both sides. This refers to coatings applied to paper by the paper manufacturer at the mill, not any additional coating that may be applied after printing (Glossy UV coating, matte coating, AQ, etc.). Also called cover stock, heavyweight papers are primarily referred to as card stock. The thickness of card stock is indicated with point sizes such as 14PT or 16PT. 100LB gloss cover has also been called a card stock. Other card stocks offered include; 19PT, 22PT, and 32PT. The address to which a carrier delivers mail. In common usage, carrier route includes city routes, rural routes, highway contact routes, post office box sections, and general delivery units. The primary colors used in 4-color process printing. CMYK is used to reproduce full color on the printed sheet. CMYK is also called process color. The mixture of clay materials that are applied to paper to improve the smoothness of the paper's surface and improve ink holdout during the printing process. Primoprint uses Aqueous coating (AQ) and UV coating. UV coating adds a gloss finish to the product and improves the vibrancy of the printed colors. Spot gloss UV can be applied to selected portions of the piece while keeping the rest a matte finish. A service offered to mailers, service bureaus, and software vendors that improves the accuracy of matching to delivery point codes, ZIP+4 codes, 5-digit Zip Codes, and carrier route codes on the mail piece. CASS provides a common platform to measure the quality of address matching software and to diagnose and correct software problems. Prepress Department that imposes multiple jobs of the same type in a press layout called a batch. Collecting is responsible for creating schedules that meet production deadlines and satisfy job turnarounds. Numbering a form, or a series of printed material where the number changes sequentially from one to another. Example: page one begins with 201, the second will get 202, the third would be 203 and so on. Lines printed in the margin of the sheet that indicates to the cutter and bindery where the finished product should be trimmed. They are also used to show what part of a photo should be used and what part should be cropped off. We do not require crop marks for print ready files. A specific shape like circle, star, etc. (any designs that cannot be done by a straight cut) which is cut by a metal blade. Door hangers are a popular product which requires die cutting. We offer limited; external die cutting as custom orders. You may submit your die line request on our customer order page to determine if we are able to produce the item for you. Another name for advertising or promotional mail sent to targeted markets. It can be any mail class, but it is usually Standard Mail. A measurement of the resolution of input, output and display devices. 300 dpi means that when printed, each square inch of your image will contain 90,000 pixels (dots). The higher the dpi (the more pixels per inch) the crisper the printed image will be. We require (digital files) to have to have a resolution of at least 300 dpi. Anything less than that is considered low resolution and may appear blurry when printed. A process of imprinting an image by applying pressure to the back side of a material to change the surface, giving it a three dimensional or raised effect. Embossing can be referred to as raised lettering. While Primoprint does not offer embossing or raised printing (thermography), we do offer both raised spot UV and raised foil. The size of a printed product after all production operations have been completed. Operations to a document after it has been printed. The finishing operations can include bindery work such as, trimming, folding, binding, die cutting, inserting or any post-press process that must be completed. The size of a printed product after printing and trimming but before any finishing operations that affect its size, such as folding. The application of metallic foil on paper using a heated die. The foil is adhered to the surface leaving the design of the die on the paper. Our foil stamp printing adds a custom touch to your printed product by applying a thin film of metal to the paper that creates a high grade, eye-catching result. The process of bending printed sheets in a specific area. Folding is one of our popular bindery jobs. Printing that goes to the edge of all four sides of the page. 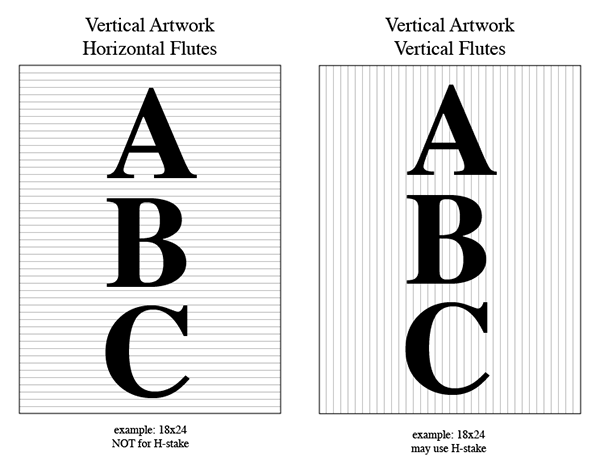 Coroplast signs have a fluted material that can have a metal "H-stake" inserted into the flutes to create a yard sign. 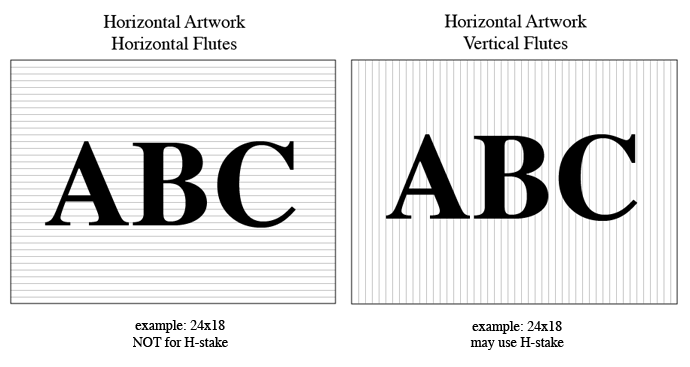 The flutes need to be vertical for the H-stake to be used properly. A coating on paper that provides a higher reflection of light, which results in a shiny appearance. Gloss coatings reduce ink absorption, which allows for more contrast, color definition and protects the card stock. Paper with a gloss finish, usually used for higher quality printing. Examples are 100LB gloss book and 100LB gloss cover. A strip of paper containing gray tones ranging from white to black. Gray scale refers to black and white printed material. Metal finger like clamps that grab the paper to pull it through the press as the sheet is being printed. The thinnest possible line or space that is still visible. Printing on the front and back of a sheet is setup so that the top of both sides is printed at the same end of the sheet. Imagine turning the sheet like the page of a book to read the reverse side. Printing on the front and back of a sheet so that the tops of each side are printed at opposite ends from each other. The top of one side is opposite the bottom of the other. You would turn the sheet over from top to bottom to read the reverse side. Also referred to as tumble or head-to-tail. A spot on a printed sheet that appears as a small white circle with ink in the center. Can be caused by particles such as dirt, dust, or bits of paper. When a production process for a printed product is done within a facility and is not sent to an outsider. Also referred to as in plant. A printing technology in which liquid ink is sprayed through tiny nozzles onto the paper in a pattern of dots, forming the image on the paper. Jobs with AQ or UV coating cannot be ink-jet printed. A letter, card or similar item placed inside another mail piece (host piece). A unique number assigned to a job by a buyer or manufacturer. The number allows the job to be tracked throughout production. Here at Primoprint, customers automatically are assigned job numbers when they place an order online. The process of applying a film, often plastic or copolymer, to both sides of a printed sheet. Lamination adds a gloss or silk finish to a printed product and provides durability, water resistance, and tear resistance. A high gloss film applied to one or both sides of a print product. Gloss lamination is optically clear, durable and is scuff, tear, and water resistant. A dull matte film applied to one or both sides of a print product. Silk lamination gives cards a luxuriously smooth feel and may dull color and contrast slightly. Durable Silk lamination is tear and water resistant. Printing a page so that when positioned for reading the width is greater than the height. A sequence required for some Enhanced Carrier Route and carrier route rates in which mail pieces are arranged by ZIP+4 codes in the order in which the carrier serves the route. The mail pieces are sequenced in delivery order. A transparent screen which has been etched with fine lines. It is used to convert a picture or photograph into a halftone dot pattern so that can be printed. Here at Primoprint, we do our best to maintain the fidelity of your creative intent through the complex process of reproduction in print. While printing 200lpi may be satisfactory, we have gone one huge step further with the adoption of Staccato (or FM) screening method that brings near photographic quality. Staccato eliminates halftone screen angles, rosettes, and screening moiré while preserving the desirable details in your artwork. Our Staccato screening process employs 20-micron dot size which is equivalent to 500lpi. The process of setting up and adjusting a printing press for a particular ink, paper, and specifications before printing. This includes adjusting the infeed, grippers, and guides, adjusting ink for proper coverage, registering copy, and matching the printed piece with the proof to be sure everything is correct. Also referred to as set up. The paper used while making all the necessary adjustments before printing the actual run. Also referred to as set up. The non-printed areas around the image area of a page. A coated paper finish that is flat, not shiny like a gloss, but still keeps much of the ink from being absorbed by the paper and creating a crisp image. Matte/Dull finish is applied to all 14PT and 16PT jobs unless it is Spot UV. The transfer of an inked image from a plate to a blanket cylinder, which in turn transfers the image to the printing material as it passes between the blanket and the impression cylinder and pressure is applied. Also referred to as offset lithography. Offset printing is used at Primoprint. An envelope with an opening along its short dimension. An envelope with an opening along its longest dimension. When an image is not printing in the exact location that it is supposed to. When printing more than one color, if the colors do not line up properly, they are out of register. Sending information from a computer to a printing device to produce a printed page is called output. Printing an image over an area that has already been printed. In printing process colors, one process color is printed over another creating a secondary color, which is a combination of two primary colors. Sometimes in the files, customers send us, there will be overprinting issues such as type or logos, not printing. Customers should be aware that we do not check for this. We highly recommend reviewing for overprinting before sending the files to us. Please read our FAQs which provide info on how to avoid these and other issues. The number of items produced over the quantity that was originally ordered. Also referred to as any paper spoiled in the process of printing. For example, if our batch is 1000 quantity batch we always overrun 150-200 sheets. A registered name for an ink color matching system used to compare, match and identify specific colors. To do so we use a Pantone book. It contains Pantone colors with their closest CMYK values. The direction in which the fibers line up during the manufacturing process. It is easier to fold, bend, or tear the paper along the same direction of the fibers. Cut sheet laser printers generally use long grain paper in which the grain runs parallel to the long side of the paper, resulting in better performance through the laser printer. A printing press that can print on the front and the back of the paper in one pass through the press. The process of printing both sides of a sheet of paper in the same pass through the press. Creating a series of holes so that the paper can be torn more easily along the line that is formed. Postage stamps and tear-off cards are common products that require perforation. The smallest unit of a digitized image created by a digital device, such as a computer, camera, or scanner. Pixel is short for "picture element." The more pixels per inch, the better the resolution. On computer monitors, the display is divided into rows and columns containing thousands or millions of pixels. Each pixel is composed of three dots representing the three color channels of red, green, and blue light that are necessary for creating a color image on computer monitors and television screens. Because of their small size, the pixels appear to merge, simulating a continuous tone image, but when magnified they appear to be tiny square blocks of light. A metal or paper light-sensitive sheet that holds an image that has been photographically produced. During the printing process, the image area picks up ink, which is then transferred to a blanket and then to paper. Payment for delivery service that is affixed or imprinted to a mail piece, usually in the form of a postage stamp, permit imprint or meter stamp. Authorization required to mail without affixing postage. A postage imprint also referred to as an indicia (The imprinted area in the upper right corner of the mail piece that indicates postage payment), is used instead. An advance payment is made to the post office, and postage payment is deducted from that deposit. We offer various types of presentation folders: Inner pocket with round cut corner: (1 or 2, left & right pockets are optional) Inner pocket with straight cut corner: (1 or 2, left & right pockets are optional) Business card slit, left or right is also optional. The process by which a mailer groups mail by ZIP Code so that it is sorted to the finest extent required by the standards for the rate claimed. Generally, presort is performed sequentially, from the lowest (finest) level to the highest level, to those destinations specified by standard and is completed at each level before the next level is prepared. Not all presort levels apply to all mailings. The machine used to print batches. Primoprint has six color and four-color presses. Printed sheets from the press that are pulled once all the makeready have been completed. The sheets are checked for quality and accuracy before authorization is given to go ahead with the full production run. Sheets may be pulled throughout the run to do press checks to assure that quality is being maintained. We do not press checks for customers. A proof that is produced on the press using the inks and paper specified for that order. We do not produce press proof unless we want to check color for a rejected job. The total quantity of pieces printed during one printing. The order quantity level at which the price of the paper or printed material goes down. One of two software systems that we use to send batches to the plating machine. When using Prinergy, batches will be sent to the Creo CTP (computer to plate). The department in charge of making customers' files "print ready." A copy of the artwork representing the finished product. It is used for review and approval. Primoprint offers on online proofs when the files are uploaded. Additionally, PDF proofs may be requested. Checking a proof for errors or discrepancies from the original copy. Drilling of holes through a stack of paper. Hole punching is used when specified by a customer for their printed piece. Applicable & popular sizes are 1/4", 1/8" & 5/16". Upon request, we can provide different sizes. A price, given by the printer or distributor, based on the specifications supplied for that product. We have an estimating department here at Primoprint that can give a price quote or any custom job. The printed marks used to align color separations for printing so that each color registers with each other. The measurement of output quality expressed in pixels (dots) per inch on a computer monitor or dots per inch on printed media. For example, a monitor displaying a resolution of 800 by 600 refers to a screen capable of displaying 800 pixels in each of 600 lines, which translates into a total of 480,000 pixels displayed on the screen. When referring to printed media, a 300dpi (dots per inch) printer, for example, is capable of outputting 300 dots in a one-inch line, which means that it can print 90,000 distinct dots per square inch (300 x 300). The additive primary colors, red, green and blue, used to display color in video monitors. Printing with a file in RGB color mode will produce a washed out appearance. Our file uploader will check for RGB, alert if RBG color mode is found and automatically convert to CMYK. Primoprint is NOT responsible for color conversions of files submitted in RGB. Learn more here. The turning or positioning of text or an image at different degrees of orientation on a page. Using a machine to die cut the corners of forms, cards, and books to create a rounded corner. The method of binding the pages of a section where the folded pages are stitched through the fold from the outside, using a wire staple (stapling). A crease applied, in a straight line, to a sheet of paper to allow it to fold easier and more accurately. Based on our equipment, we score any sizes between: 3" x 4" (min) to 11" x 17" (max) on 100LB book, 100LB Cover and 14PT papers. 16PT can be scored when a Lamination is added. Scored in half, is among the most popular. A method of wrapping packages or products with a plastic film and then applying heat so that the wrap fits tight to the product. Shrink-wrapping is used to package a product in specific quantities and is also used for protection purposes. It also adds some stability to the product when storing. Also referred to as plastic wrapping. Shrink Wrapping is NOT offered at Primoprint. A wooden platform used to hold stacks of paper or cartons. Used to store or ship materials or finished products. A paperboard jacket that fits over the four sides (top, bottom, and two parallel sides) of a letter tray to keep the mail inside the tray from falling out. Cutting paper through the use of a cutting wheel. Paper may be slit into smaller sheets or a web of paper may be slit into narrower rolls. A slit can also refer to cuts made that do not divide a sheet. For example, on a presentation folder, smaller diagonal slits can be made on the pockets where business cards can then be displayed. Book binding that consists of a spiral wire or plastic that is wound through holes. Also referred to as coil binding. Primoprint does not offer this service. Coating paper only in specific areas as opposed to all over coating. In a Spot UV job, the piece gets a UV coating in only specific areas and does not get any coating in any other places. Spot UV can be referred to as spot varnish. Printing with one or more solid colors, generally, black ink is used with the addition of other colors. It is used to add highlight and add color to a printed product without having to print with four-color process. We do not offer spot color (PMS) printing. Images are converted digitally into screens made up of very small dots which are equal in size, but of variable spacing. The variable dot pattern eliminates many of the moiré patterns and allows for more than four colors to be used to represent an image. This is the primary aspect of high-fidelity printing. At Primoprint we do our best to maintain the fidelity of your creative intent through the complex process of reproduction in print. While printing 200lpi may be satisfactory, we have gone one huge step further with the adoption of Staccato (or FM) screening method that brings near photographic quality. Staccato eliminates halftone screen angles, rosettes, and screening moiré while preserving the desirable details in your artwork. Our Staccato screening process employs 20-micron dot size which is equivalent to 500lpi. A booklet containing samples of paper or ink colors. A preset model that acts as a structure for setting up a similar product. Primoprint offers templates for each standard product. Customers can download templates online. A container used in postal facilities to hold letters and First-Class Mail flats. It is used as a basic unit of mail quantity for purposes of preparing mail to a qualify for discounted postage rates. Also see full flat tray, full letter tray, less-than-full tray, and overflow tray. The process of cutting the product to its finished size. The excess that is cut off is also referred to as the trim. Combining various roll sizes to be slit from a full-width roll from the paper machine so that an acceptable percentage of the salable width will be used. The accumulated time between receipt of an order and completion of the finished product. Here at Primoprint, we offer a variety of turnaround depending on the product including, Next Day + 1, 2-4 days, and 5-7 days. The process of converting text into type used for printing. Ultra Violet. The part of the spectrum where the wavelength of light is shorter than the wavelength of visible light. A liquid coating applied to the printed piece, which is then bonded and cured with ultraviolet light. This coating is used to provide a protective coating to the printed image. Please note that you cannot write or imprint on a UV coated job. A thin, liquid protective coating, either matte or glossy that is applied to the product. It adds protection and enhances the appearance of the product. It can be applied as an all-over coating, or it can be applied as a spot coating. The provider of a product or service. Also referred to as the supplier. An envelope with a die cut opening that is intended to have information show through from the piece inside the envelope. A printing method where different pages are assembled so that they are on one plate. One side is printed and the sheet is turned from front to rear so that you are using the opposite edge as the gripper edge and then the second side is printed. The product is then cut apart to make two finished items. A printing method where different pages are assembled so that they are on one plate. One side is printed, and then the sheet is turned over so that you are using the same gripper edge and then the second side is printed. The product is then cut apart to make two finished items. Zipping is a way to compress electronic files A compressed file is considered "zipped." A system of 5-digit codes that identifies the individual post office or metropolitan area delivery station associated with an address. ZIP+4 is an enhanced code consisting of the 5-digit ZIP Code and four additional digits that identify a specific range of delivery addresses. A nine-digit POSTNET barcode consisting of 52 vertical bars. Also see Postal Numeric Encoding Technique.